Martha and Jeff Golub are music lovers through and through. 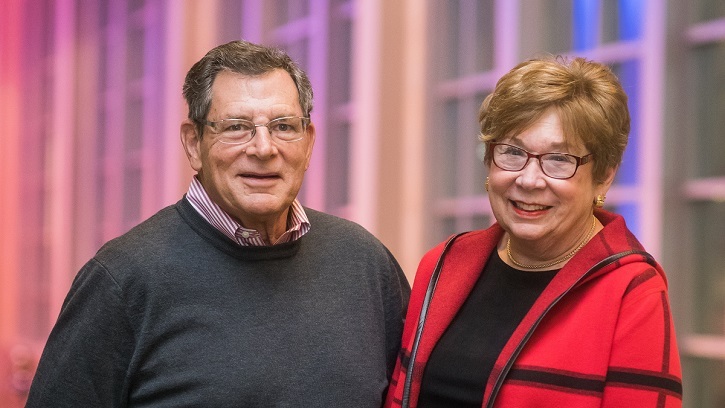 Two of the Seattle Symphony’s biggest fans, Martha and Jeff Golub attend more than 30 concerts each year and eagerly await the announcement of each new season. They renew their seats as soon as their brochure arrives, a tradition they have maintained since moving to Seattle in 2004. They are also longtime supporters of the Symphony and Jeff is a member of the Musical Legacy Society. Did one of you introduce the other to symphonic music or has it always been a part of your lives? Martha: Jeff introduced me to classical music. I’ve always loved music, but growing up it was more country and pop — that sort of thing — but I’ve really come to love this music. I like the chamber music concerts especially. I feel like there is such a connection between the musicians and the audience during those concerts. Jeff: I was raised in Los Angeles, but I came up here to do my senior year of undergraduate at the University of Washington. My roommate played classical music LPs all the time, and one evening he asked if I wanted to go with him to hear the Seattle Symphony. They were performing a piece that I really liked, Dvořák’s “New World” Symphony. I said, “Oh, are they playing the whole thing, both sides?” [laughs] That was the extent of my knowledge at that time. I went and I really liked it, so I started going regularly and it just built up from there. Today I’m still not the most knowledgeable — I’m working on it — but in terms of appreciation, I’m pretty much at the top. I’m very enthusiastic about it. I love it. Do you have a favorite memory of experiencing music together? M & J: There was one time years ago — the Russian National Orchestra was coming to Benaroya Hall and we noticed they were going to play on both Thursday and Friday — a different program each night — so we got tickets for both. On Thursday night they were wonderful, but the next night both orchestras were on stage together, the Russian National Orchestra and the Seattle Symphony. They were playing Tchaikovsky Symphony No. 5. That was when Seattle had the earthquake, remember? Because of those two orchestras on stage. [laughs] The sound was so big! It was just fabulous. Will you share a bit about the experience of receiving your season announcement brochure each year? M & J: When we get the program for the new season in the mail or if it shows up at a concert, we’ll take it home and look it over, but it doesn’t matter what the Symphony is doing; we’re going to renew. We’ll call the very next day. We just want to nail it down and reserve our same seats. We just love our seats. We’ve gotten to know the couple in front of us and the one next to us, and we’ve become good friends. You see a lot of familiar faces at the concerts. You look around and you know these are kindred spirits. Beyond the concerts on stage, what is your favorite thing about being a part of the Symphony community? M & J: The opportunities to meet the musicians. They are our superheroes. Their artistry is such that whenever we get a chance to meet them we always tell them how much we appreciate them. That’s always a pleasure. And look at the players the Symphony has brought in: Demarre McGill, I mean that’s as good as you get; Benjamin Lulich, with the tremendous background he has; and it goes on and on from there. In addition to subscribing you are longtime supporters of the Symphony. What inspires you to give? M & J: Look at the pleasure we get from this. Look what it’s doing for us. At the end of a concert we think, "How come the whole world isn’t here?" It’s just essential. The music is outstanding. For us, it’s just giving back. Thank you, Martha and Jeff, for sharing your story and for being a part of our Seattle Symphony family! The concerts you love are made possible by generous people like you. Join Martha and Jeff by making your donation for symphonic music today, or contact Donor Relations at friends@seattlesymphony.org or 206.215.4832 to learn more about how you can support your Seattle Symphony. Thank you!